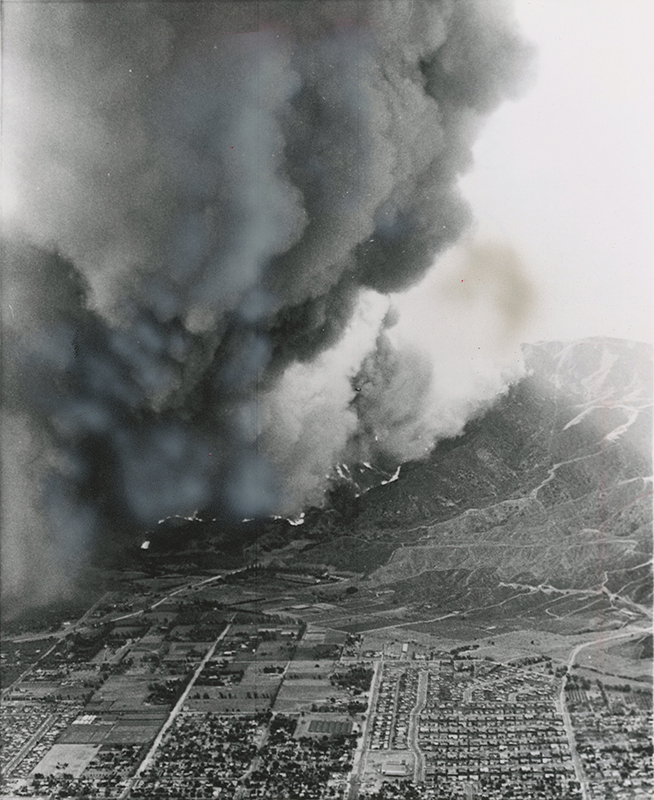 SCVHistory.com LW3050 | 1962 Melody Ranch Fire | San Fernando Valley Aerial View, 6-28-1962. August 28, 1962 — San Fernando Valley view to the east, as the brush fire(s) burn into the San Gabriel Mountains. A brush fire raced out of control Tuesday night [8-28-1962] across the San Gabriel mountains, away from the city of San Fernando. the homes in the foreground are in Los Angeles [San Fernando Valley]. Olive View sanatorium, on fire, is hidden from view by the smoke. LW3050: 9600 dpi jpeg from original wire photo purchased 2017 by Leon Worden.